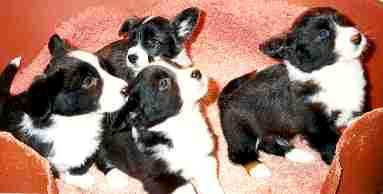 Cardigan Corgis are an easy breed to maintain. They are also an energetic breed who love to go on a long walk. This does not mean that owners have to take a five-mile walk every day, unless of they want to! Puppies are very easy to house train. Cardigan Corgis do not like to live in dirty conditions, so will not soil their beds if they can help it. Newspaper at the door to the room where they sleep when they are babies will make them go there and not all over the room. As they grow up they will be able to go through the night with no 'accidents". Always let the puppy (or adult dog) out immediately they have been fed. It does not have to be long, but they like to relieve themselves after eating. Change the bedding the dog sleeps on regularly, this helps to keep the dog clean. There are plenty of good bedding materials available that will wash in an ordinary washing ma- chine. Also have few old towels handy for drying feet and tummy after walking in wet conditions. Cardigan Corgis are easy to obedience train. Take a puppy to obedience classes in your vicinity for basic obedience. This will teach the owner as well as the puppy. An obedient dog is a joy to own and Cardigans like nothing better than to please their owner. For care of the coat you need a good quality bristle brush and a comb. The brush will take out any mud that may be in the coat after a walk in wet conditions. The comb will help take out dead coat when the dog is moulting. A bath once or twice a year (or if they go rolling in muck!) will keep the coat in good condition and keep the dog from smelling 'doggy'. Make a regular check of feet and teeth. Once a week is enough for this. If the nails need trimming buy a good quality nail clipper or file. Either trim the nail, making sure you do not cut into the quick or file them back. The hair under the pads should also be trimmed back to the shape of the pads. If the teeth start to get tartar on them you can scale them yourself or have your Veterinary Surgeon remove it. There are some very good dog toothpaste's on the market that will help control any tooth problems your dog may have. Chewing bones (preferably sterilised bones) and hard biscuits will also help to keep the teeth and gums healthy. Fresh vegetables are good as an extra to the diet of a dog; they also like them so they are a treat to a dog. It is much better than chocolates or cakes and all things fattening. All dogs should be regularly wormed. Good quality worming tablets are available from pet supply shops. It is recommended that dogs be wormed every six months. Keep a check on the weight of your dog; nothing is worse than for the dog to be overweight. Plenty of exercise and a healthy diet and lots of love will mean a happy dog.